Suitable for all kinds fo cooking applications. Store in a cool and dry place. Peanut oil may become cloudy when stored at low temperature (below 10C) due to its natural properties and will resume clear when warmed at room temperature. 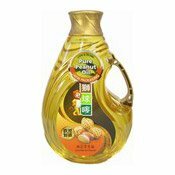 This product is manufactured in the facility also produced peanut oil, sesame oil and soybean oil. Ingredients: Pure Peanut Oil (100%). Simply enter your details below and we will send you an e-mail when “Pure Peanut Oil (Groundnut) (獅球嘜純正花生油)” is back in stock!